The chapter proposes an extension of the traditional differential evolution (DE) algorithm to handle the effect of noise in the objective surface. The proposed extension offers four merits with respect to its traditional counterpart. The first strategy is concerned with determining the effective fitness estimate of a trial solution on the basis of the distribution of its noisy fitness samples, instead of their conventional averaging. Second, the DE/current-to-best/1 mutation scheme is amended to generate promising donor vectors in the presence of noise in the objective surface. The third strategy, referred to as stochastic learning automata-induced adaptive sampling, is employed to judiciously select the sample size for the periodic fitness evaluation of a trial solution based on the fitness estimate and the fitness variance in its local neighborhood. Finally, a modified probabilistic crowding-induced niching behavior is introduced to promote quality solutions to the next generation, ensuring both the population quality and diversity. 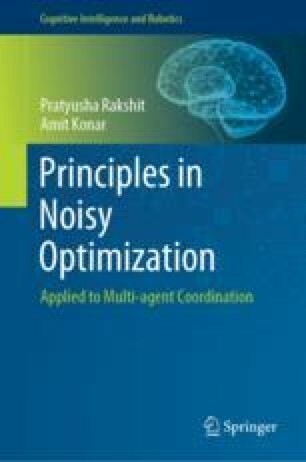 Computer simulations performed on a noisy version of a renowned set of 28 benchmark functions disclose that the proposed algorithm surpasses its contestants with respect to function error value, the number of successful runs, and successful performance metrics. The performance of the proposed algorithm has been studied on a real-world multi-robot path-planning problem. The application justifies the importance of the proposed noise handling strategies in practical systems.